A 51-year-old male presented 3 months following a fall at work. 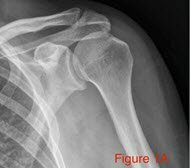 He said that at the time of the injury, he felt he had sustained a shoulder dislocation that self-reduced. The patient works for a package delivery service, and is required to lift heavy loads (50 to 70 pounds) to chest level. Since the injury, he has had difficulty with reaching, lifting, pulling, and pushing, and he has been unable to raise his arm overhead. He has had substantial difficulty sleeping at night. He was seen by a workman’s compensation physician and sent for 12 weeks of physical therapy. He did not experience much improvement and continued to feel 10/10 pain. 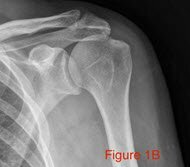 He noted that he had a history of pre-existing shoulder pain that was unrelated to a specific injury. 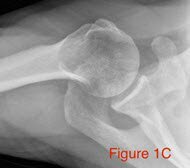 Figures 1a-c. Preoperative radiographs demonstrating mild proximal humeral migration, no evidence of glenohumeral arthrosis. 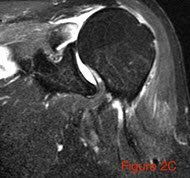 Figures 2a-c. Coronal MRI sequence exhibits a full-thickness, retracted tear of supraspinatus tendon with retraction medial to the glenoid. Proximal migration of the humerus is again seen. 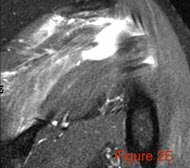 Figures 2d-e. Coronal MRI sequence demonstrates full-thickness tearing of the infraspinatus tendon with retraction. The teres minor is intact. 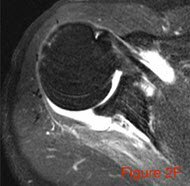 Figures 2f-g. Axial and sagittal MRI sequence demonstrating an intact subscapularis tendon with biceps located within the bicipital groove. 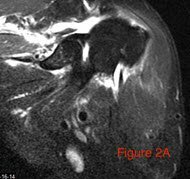 Fatty atrophy of the supraspinatus tendon is exhibited. 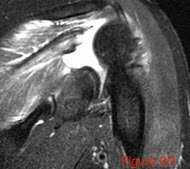 The patient underwent an attempted rotator cuff repair. 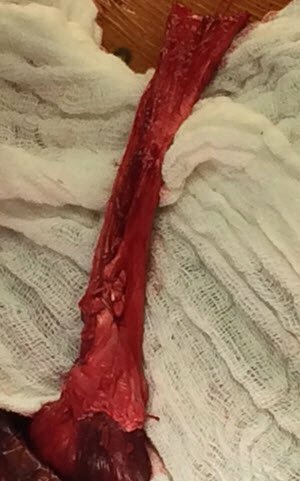 However, the tendon was found to be irreparable. 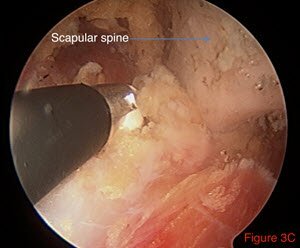 Figures 3a-d. Intraoperative arthroscopy images. 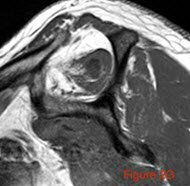 The supraspinatus tendon is seen torn and retracted medial to the glenoid. Figure 3c (third image) demonstrates posterior interval slide release with exposure of the scapular spine. Traction stitches were also placed in the tendon to facilitate tendon mobilization, as seen in Figure 3d (bottom image). A partial repair was then attempted, but the suture material pulled out of the infraspinatus during knot tying. 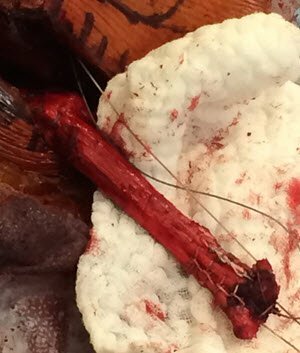 As a result, a debridement and biceps tenotomy was performed. The patient then underwent 12 weeks of physical therapy. 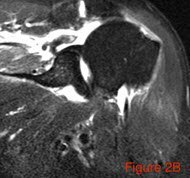 He unfortunately had no significant functional improvement and remained with a painful pseudoparalytic shoulder; he was unable to work. 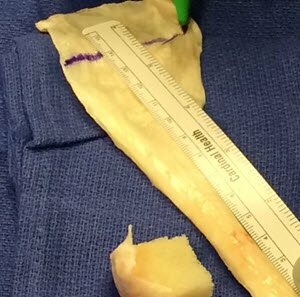 After consultation with the patient, the authors performed a left shoulder lower trapezius tendon transfer with Achilles allograft reconstruction. Figure 4. 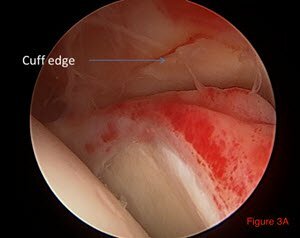 The lower border of the trapezius tendon is identified. Figures 5a-c. In Figure 5a (top), the appropriate length of Achilles tendon allograft is marked and resected. In Figures 5b-c (middle and bottom), the allograft Achilles tendon is transfixed to the native trapezius tendon in Krackow fashion using a heavy, braided non-absorbable suture. The patient tolerated the procedure well, without complications. He was discharged home in a gunslinger brace, where he was allowed to perform elbow, wrist, and hand motion in a supine position. Brian Lee, MD, and Surena Namdari, MD, MSc, are from The Rothman Institute at Thomas Jefferson University Hospital, Philadelphia, Pennsylvania. Elhassan B, Bishop A, Shin A: Trapezius transfer to restore external rotation in a patient with a brachial plexus injury. 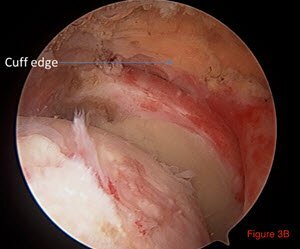 J Bone Joint Surg 2009;91:939-944. Elhassan B. Lower trapezius transfer for shoulder external rotation in patients with paralytic shoulder. J Hand Surg 2014;39:556-562. 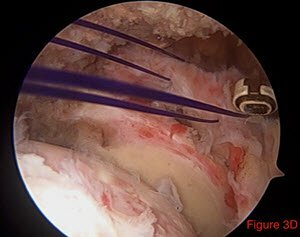 Omid R, Lee B. Tendon transfers for irreparable rotator cuff tears. J Am Acad Orthop Surg 2013;21:492-501. Donegan RP, Jobin CM, Chamberlain AM, Namdari S, Tang CT, Galatz LM. 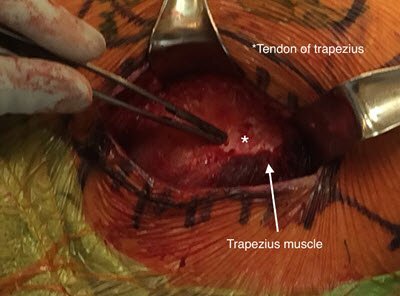 Lower Trapezius Tendon Transfer for Irreparable Posterior-Superior Rotator Cuff Tears. Poster presented at the annual meeting of the American Academy of Orthopaedic Surgeons, March 2014.